Innovation nurtures and develops students to be academically successful, emotionally healthy and equipped to lead self-directed and fulfilling lives. We are a community school that earnestly seeks to provide services for students and their families based on their needs. We welcome all students and empower them to adapt, excel, innovate and lead. By instilling the core values of innovation, collaboration, tolerance, respect, activism, safety and accountability, students will graduate prepared for success in college and careers. At Innovation, through our school wide systems, we harness the creativity, skill and hard work of each community member. We believe that all members of the community are active learners and we encourage the entire school community to engage in inquiry and explore their curiosities to discover and create new opportunities. At Innovation, we encourage our entire school community to be actively engaged in maintaining a strong school culture, academic expectations and a positive learning environment. We empower all members of the community (students, parents, faculty and school leadership) to have a voice and be active in the success of the school. Innovation seeks to create an engaged citizenry. Our programs, services and experiential instructional model, we promote direct action to ensure social justice within the school and throughout the greater community through community service, experiential learning and civic involvement. Respect for the dignity of all school stakeholders is critical to the development and growth of our community. We accept the diversity and understand the richness of our identities as fundamental to Innovation’s principles and approach. 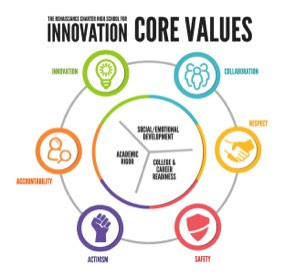 At Innovation, all members of the school community feel empowered, accepted, protected, and valued for their contributions, ideas, and support of the mission and vision of the school. We believe in individuals’ rights to express their identity in a respectful and constructive space. At Innovation, we believe that accountability is the foundation of leadership. At Innovation, accountability means that all stakeholders—i.e. each student, teacher, administrator and family member—are responsible in their respective roles for the success of the school.